I Am Lactose Intolerant -What Can I Eat? HomeI Am Lactose Intolerant -What Can I Eat? An individual who is lactose intolerant is not able to fully digest the milk sugar called lactose, in dairy products. 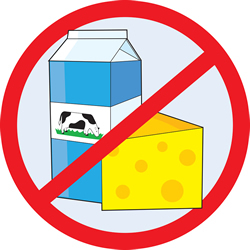 Lactose intolerance occurs when the body is unable to breakdown all of the lactose that is found in the foods you eat. Lactose intolerance is also called lactase deficiency – an enzyme produced by the cells lining the small intestine. There are individuals that have low levels of lactase that experience no signs and symptoms of this condition and there are others that do experience signs and symptoms usually after eating or drinking foods that contain lactose. Symptoms can include diarrhea, gas, nausea, bloating, and stomach cramps. These symptoms can be controlled by choosing a balanced diet plan that carefully limits dairy products. Foods that contain lactose are milk, yogurt, cheese, ice cream and sherbet. You also must read product food labels to check if the ingredients contain lactose. These food items do have lactose: milk solids/powder, cream, whey lactose, margarine, curds, sauces and gravies, frostings, salad dressings, cookies, candy, breads, baked goods, and processed meats. If you are lactose intolerant, you can still eat well and be healthy. Drinking lactose reduced or lactose free milk products like Lactaid milk, soy milk and rice milk is always an option. Also, you can try the over-the-counter tablets containing the lactase enzyme to help you digest dairy products better. Your best bet is to use caution when eating dairy products. It is a good idea to experiment with different varieties of dairy products and see what you can handle. For example, try eating small servings of yogurt made with active and live bacterial cultures. Or eat hard cheeses like Swiss or cheddar that have smaller amounts of lactose.